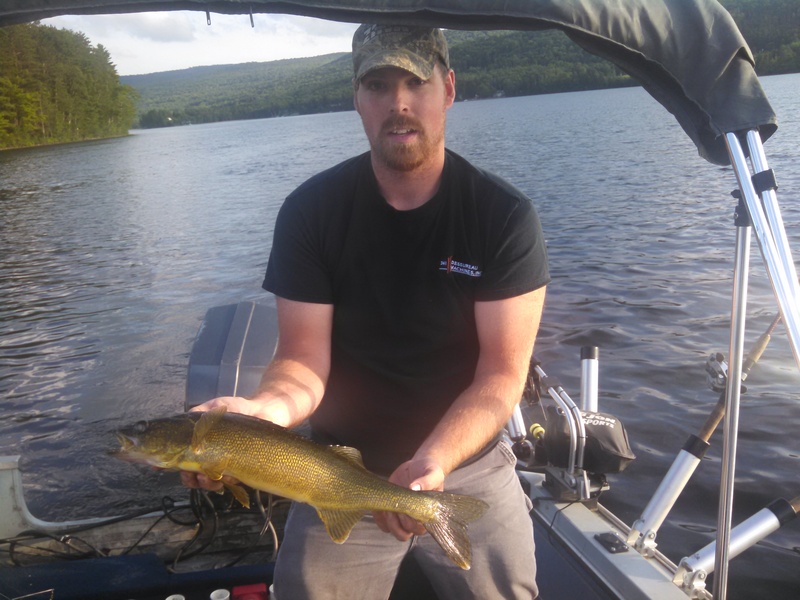 I’ve put a lot of walleye in the boat the past couple of years fishing the Connecticut River and the tributaries of Lake Champlain jigging. One thing we haven’t done a lot of is learning how to troll for them over large areas. 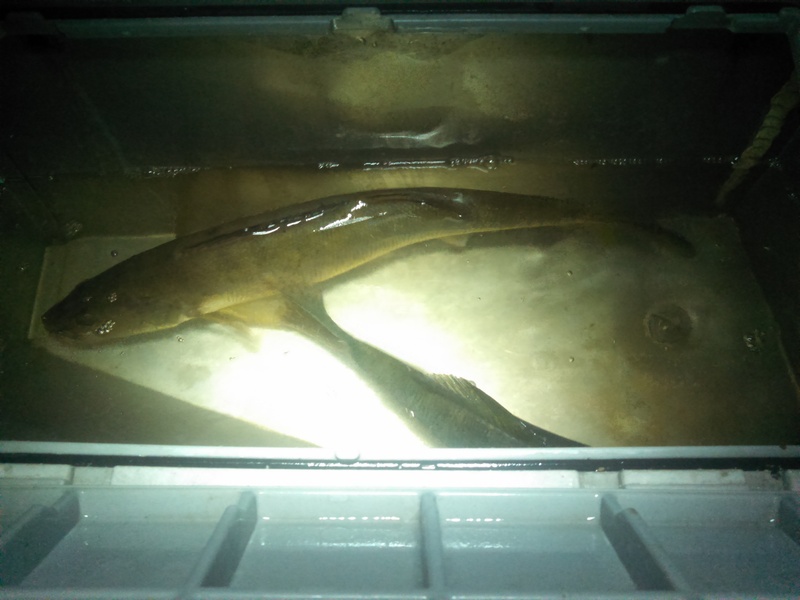 The opportunity arose to going trolling for walleye with a friend and I jumped at the chance to learn something new. Our plan was to take an afternoon/evening trip to one of the few inland ponds in Vermont that has a sustainable walleye population. I had never personally fished this pond before and my fishing buddy had only been on it a few times in the past having decent success. The pond was great, one deep hole but lots of humps with weeds a top of them and rocky shores. I wanted to learn how to run in-line planner boards with cranks so we set one board on either side with cranks and two lines out the back running spinners. There is a lot more to trolling than just simply cruising around dragging baits behind the boat, especially for walleye and I quickly learned why. 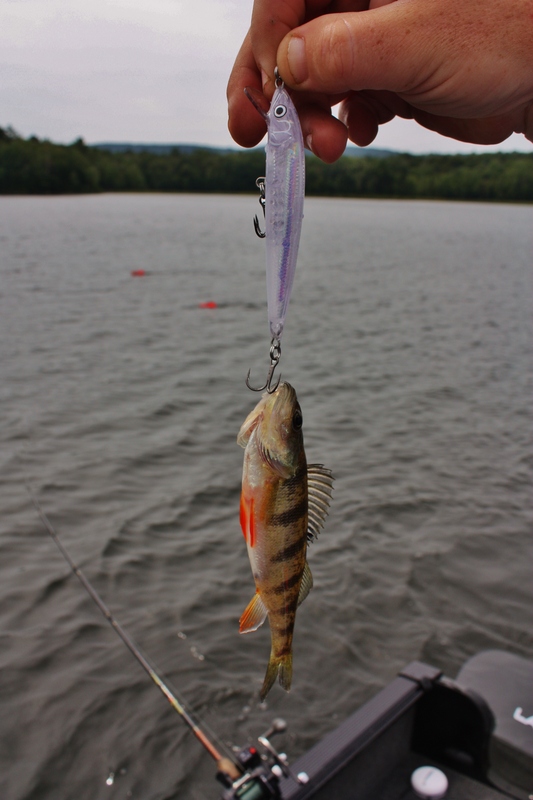 Speed and boat depth control are very important to keep your baits at an effective depth. 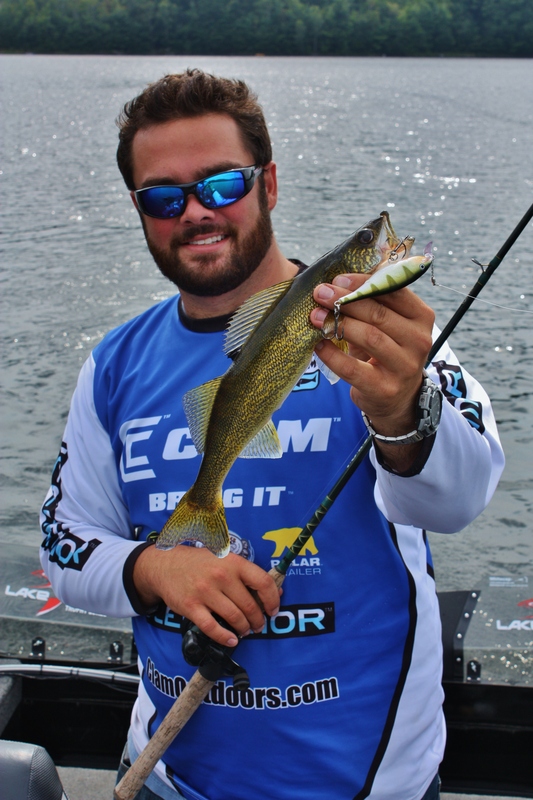 A good sonar unit with a chartplotter is also an essential tool in catching roaming walleye. We made several passes through our first spot and I missed a decent fish on the spinner. Through conversation about good places to look for fish we made our way through a stretch that my buddy hadn’t fished before. This particular spot was nothing more than a gradual inside turn pushing up to a rocky shore, I thought it looked like a fishy spot on Navionics. While we made our first pass through the spot, we had our first fish on for the afternoon. 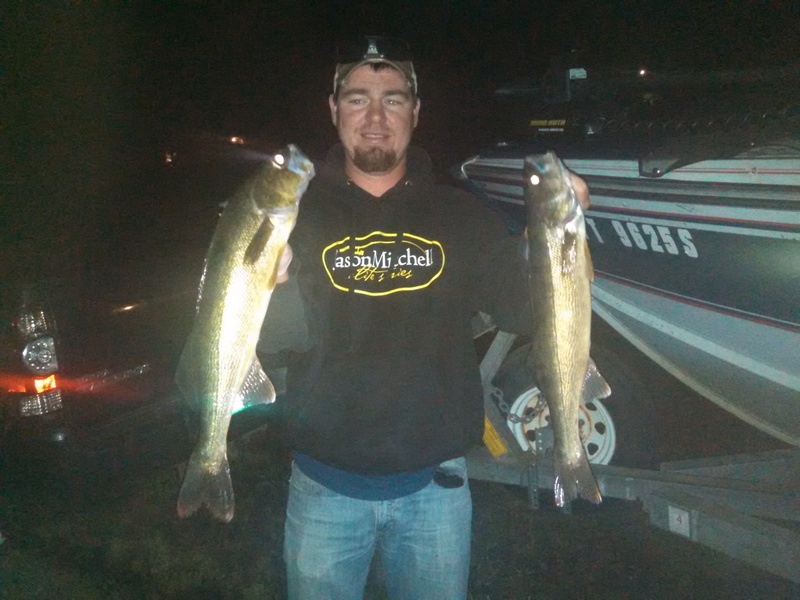 The 21” walleye came on a spinner tipped with a crawler. Starting to think that the spinner bite was key, we switched over to running just spinners. We had a quick bite to eat and motored over to another spot on a rocky hump. While making our first pass, we started to mark a good number of fish laying on the bottom when we hooked into our second fish of the day. Another nice walleye, this one coming into the net at 22”. As the sun went down and daylight faded, we decided to call it a day. A very productive day in my mind. Some the best ways to learn something new is to just do it, it also helps to have good friends that are willing to share with you their knowledge. Looking at pictures and articles from this past year has made us realize how much of our time on the water is dedicated to panfish. Maybe this is because it’s what we know and have locally available for us but when an opportunity to get out of our comfort level presents itself, it is hard to resist. Two years in a row now, I have had the pleasure of fishing on the Hudson River aboard the Lazy D And Me captained by Dan Lussier. 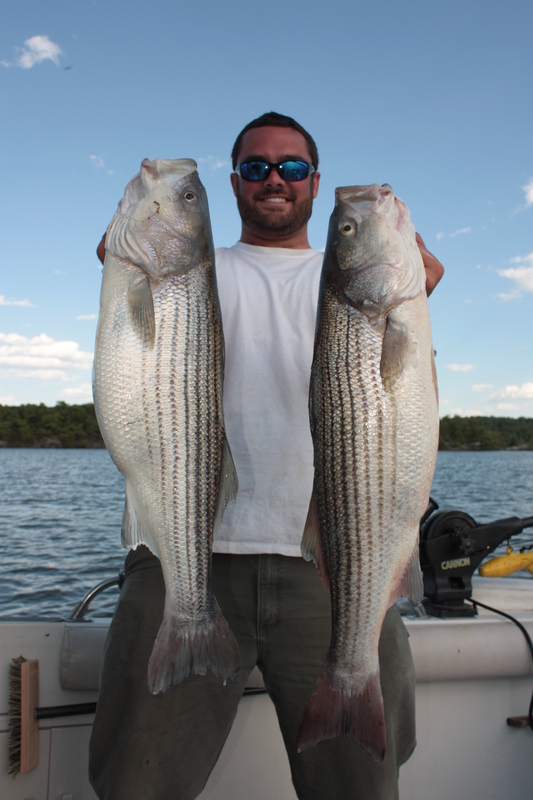 The target species for this destination is the mighty striped bass. Both years, along with Captain Dan and I on the boat has been owner of Fish Hounds Outdoors, James Vladyka and his father Larry. 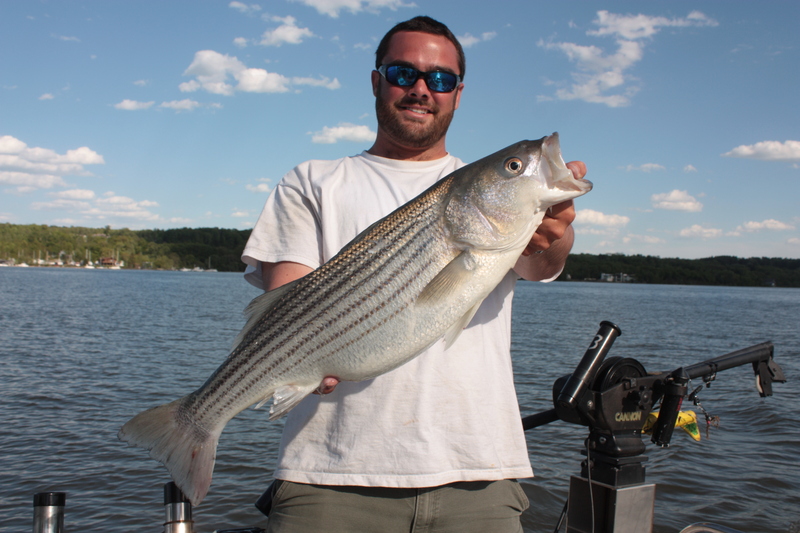 Striper season on the Hudson River has the potential to produce trophy fish. According to the New York Department of Environmental Conservation, the Hudson is the main spawning ground for these bass. Stripers are an anadromous fish meaning that they are born in freshwater, spend the majority of their life in salt water, and them return to freshwater to spawn. Timeliness of this transition to freshwater depends on the weather throughout the spring as well as current weather conditions, water temperature, and growing vegetation. When all these factors align, the month of May tends to be prime time with mid month being the best. Watching the reports roll in throughout the two weeks prior had us pumped up! It was hard to sleep through the nights leading up to the trip with reports of 20, 30, and even 40 pounders being pulled! The season is short and is dependent mainly on the water temperature. As the water warms, the water chestnuts begin to grow. They exhibit extreme growth and can reach lengths of up to 16 feet. When the chestnuts really take hold, the fish are on their way out as the water temperature is past its prime. Of course not all fish move downriver at the same time but the few that still wrapping up their business are hard to target. Trolling through these dense weeds leaves anglers constantly checking their baits. Although catching these fish doesn’t take a super secret technique, before last year, I had never experienced fishing like this. For a basic set up all you need are downriggers and large stickbaits which makes this fishing possible by many, even those with smaller boats. Sure there are some big water boats out there trolling but we see many “bass boats” and smaller 14′ aluminums. As we troll along, we see the majority of the other fishermen using the same method. Although productive, it is not the only option. Some of the other techniques are to use dipsy divers, chunked bait, and long-lining. Taken with a grain of salt, keeping tabs on the radio allows anglers to adjust baits, speeds, and depths depending on the fast moving and finicky pods of fish. Obviously, success comes to those who can piece together the correct sequence of moves. Just like every other species, these striped bass want the bait presented precisely and on most occasions, different every day depending on the water, weather, and their unpredictable movements. Through the years, Captain Dan has put together quite a collection of lures to target these fish. 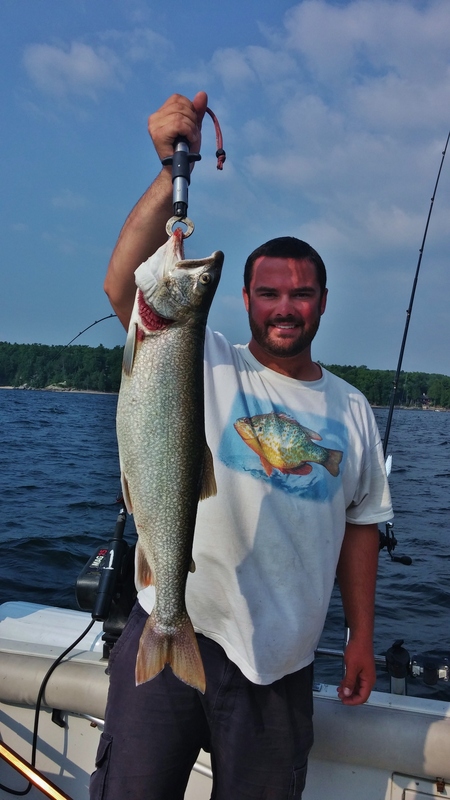 On our outings, we have mainly pulled the 7″ Rapala F18. Color depends on the day, but it seems as though we always have a “hot steel” and “bleeding hot olive” behind the boat. To put things into perspective, last year the trip that we made had pretty much the same conditions but a little more wind. As we cruised around trying to locate fish with our staggered baits, the number of thumps that we were getting on our downrigger balls was unreal. The balls were brightly colored so we matched our baits. In general we were running out lures 25-45 feet behind the downrigger ball. With no increase in the number of bites, even when large pods of fish were present, we shortened up the distance. Running the baits within a few feet of the downrigger ball increased the number of fish that we hooked up with. As we work up and down the river, speed is a big factor. Because we are on a river/tidal system, the surface speed is most likely different than whatever depth we are running our baits at. Because of this, the use of a Sub-Troll 900 or similar unit is huge. This allows us to troll the baits at the perfect speed rather than at the speed of boat. The speed the fish seem to prefer hovers right around 3 mph at the ball. A big upgrade for the Lazy D And Me this year was a kicker motor with remote steering. Not only does it save on some fuel from using the big motor, but it allows Dan to drive the boat without having to sit at the helm. Not to mention, he can really fine tune his speed. At times a tenth of a mile of a mile an hour can make all the difference. Another addition to Dan’s arsenal is the new Lowrance HDS Gen 2 Touch Screen fish finder with structure scan and side imaging. This unit combined with a Navionics chip helps with locating these fast moving fish. It is possible to not only locate these fish using the side scan but you can get a relative idea of their size after looking at and comparing multiple pods. Although there are constant conversations going on the radios, Captain Dan works with several other fisherman that are out there every day to zero in on fish. 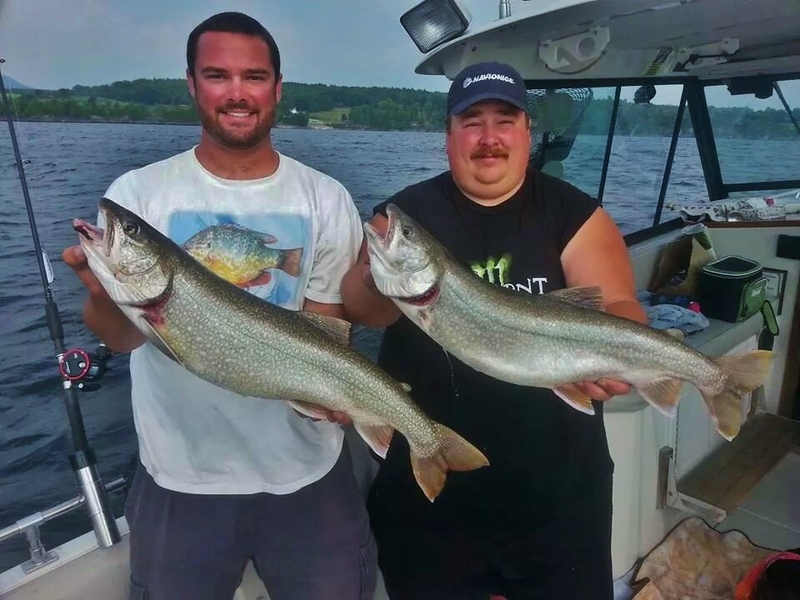 Having connections allows him and a few select others to consistently put their clients on more and larger fish. 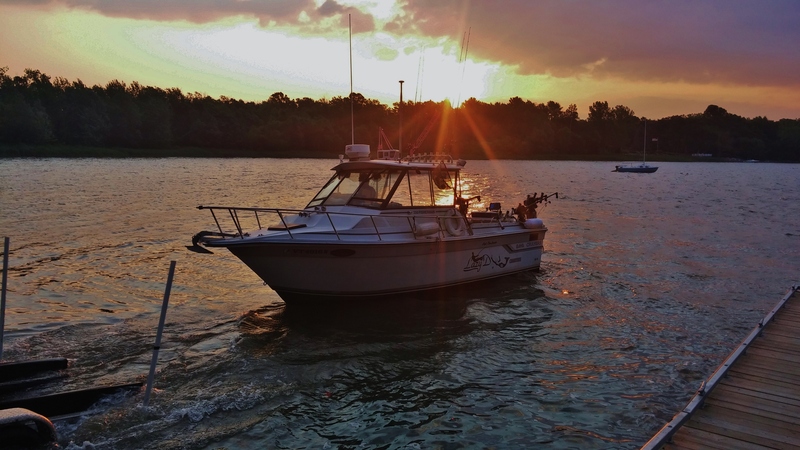 With over 15 years of experience on the Hudson River, it’s hard to trust your time on the water with anyone else! If you would like to experience exceptional striper fishing on the Hudson River, go to www.lazydandme.com or you can give Captain Dan Lussier a call at 1-802-558-7633. 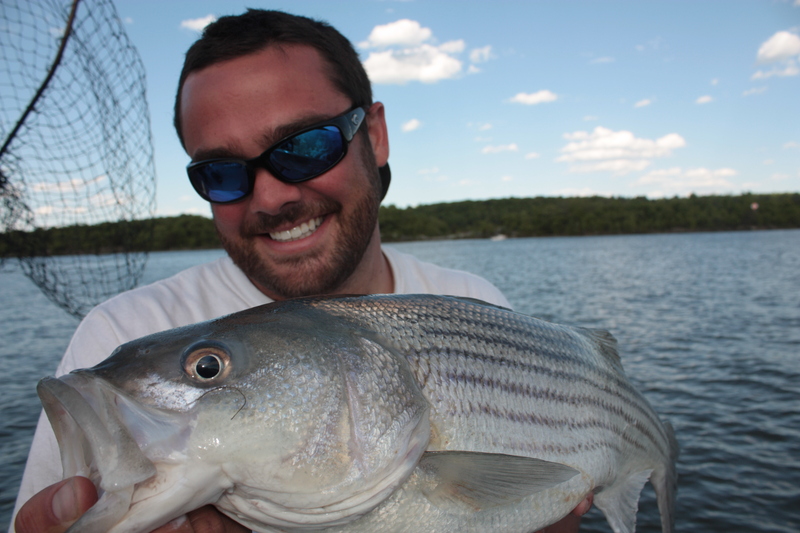 Check out Striper Fishing On The Hudson River on our YouTube page for some of the action!